Here's our dog Patches. 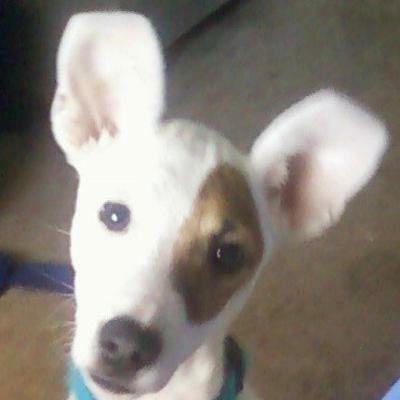 He's a 4 month old male Jack Russell. He loves to play with kids, other dogs, cats and of course don't forget his chew toys! Oh my.. what a sweet little face. Patches is simply adorable! Oh Patches you are a real cutie, I also love your ears the way the tips bend backs make you look so Cute. That is the best name ever for him. I love the white ears. Are they pricked (always stand up) or not? That's great that you are introducing him to people, kids and other dogs. A kitten (not a cat) wouldn't be a bad idea either. To train him I suggest a puppy playgroup if you have one in your area. If not I would use Dove Cresswell's that is to the right of this message.